Saturday, I may have head the voice of Gaia. What you say is Gaia or for that matter her voice? In Greek mythology, Gaia (/ˈɡeɪ.ə/ or /ˈɡaɪ.ə/; from Ancient Greek Γαῖα, a poetical form of Gē Γῆ, “land” or “earth”; also Gaea, orGe) was the personification of the Earth, one of the Greek primordial deities. Gaia was the great mother of all: the primal Greek Mother Goddess; creator and giver of birth to the Earth and all the Universe; the heavenly gods, the Titans, and the Giants were born to her. The gods reigning over their classical pantheon were born from her union with Uranus (the sky), while the sea-gods were born from her union with Pontus (the sea). Her equivalent in the Roman pantheon was Terra. The “personification of earth”…. ” the great mother of all”. I think this is a good definition of nature and of the earth. Also from Wikipedia is the Gaia hypothisis.. The Gaia hypothesis, also known as Gaia theory or Gaia principle, proposes that organisms interact with their inorganic surroundings on Earth to form a self-regulating, complex system that contributes to maintaining the conditions for life on the planet. Topics of interest include how the biosphere and the evolution of life forms affect the stability of global temperature, ocean salinity, oxygen in the atmosphereand other environmental variables that affect the habitability of Earth. The hypothesis, which is named after the Greek goddess Gaia, was formulated by the scientist James Lovelock and co-developed by themicrobiologist Lynn Margulis in the 1970s. While early versions of the hypothesis were criticized for being teleological and contradicting principles of natural selection, later refinements have resulted in ideas highlighted by the Gaia Hypothesis being used in subjects such asgeophysiology, Earth system science, biogeochemistry, systems ecology, and climate science. In 2006, the Geological Society of London awarded Lovelock the Wollaston Medal largely for his work on the Gaia theory. The idea that the earth itself may be a self regulating organism makes sense to me. Also the idea that different organism seem to communicate with each other in order to maintain conditions for life on this planet. Recent research by mycologists have discovered this fantastic relationship between fungi and trees and other plants. Plants have a very special compound, chlorophyll, which allows them to eat light and use that solar energy to convert carbon from the atmosphere and hydrogen and oxygen from water and create carbohydrates… sugars. 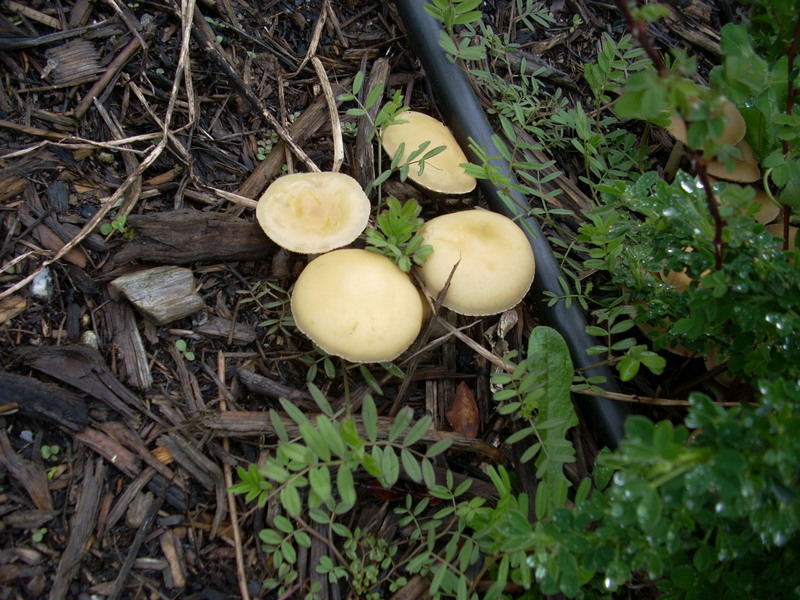 Members of the fungi clan lack this compound so cannot create their own sugars. 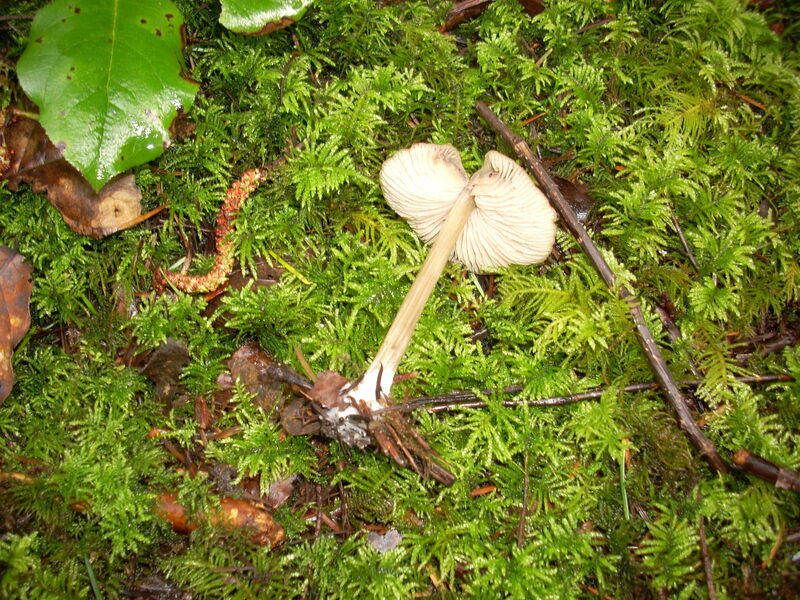 Over millennium, plants and fungi have worked out an agreement where fungi feed water and other trace elements to plants and trees and in exchange the plants feed the fungi sugars. Science has told us that some of the largest organisms in the world are not whales but certain tree species and fungi. These fibers connect with other fungi and especially with the roots of trees where that communication and exchange takes place. 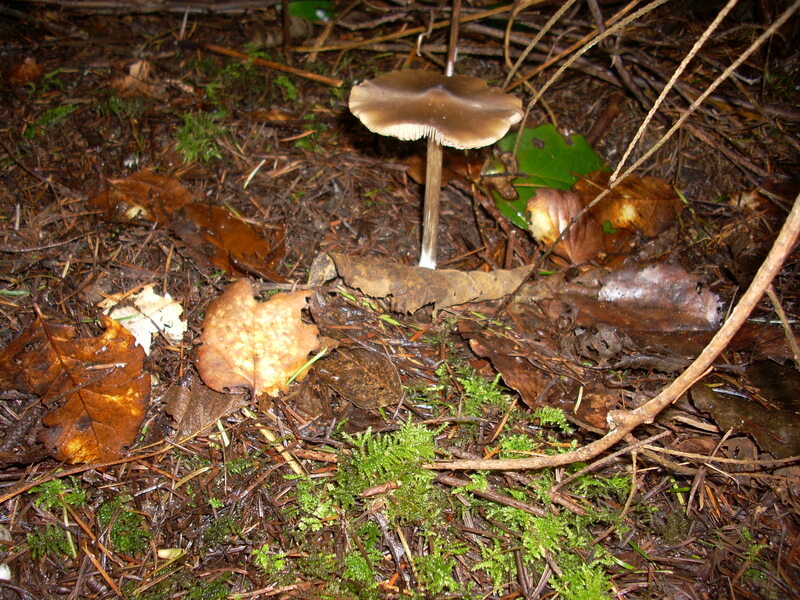 Researchers have discovered one mushroom, the honey mushroom, or Armillaria mellea, which covers thousands if hectares on a mountain in Oregon. Similarly, there exist huge forests of birch trees, that are in fact one organism, all interconnected through their roots. Put those two together and what do you have? Gaia. Is Gaia conscious or aware? Does it think in the way that we as humans think? I don’t know. We know that plants move, although very slowly. We have known since the time of the Greeks that plants move in the direction of sunlight called heliotropism. We also know that plant roots move in the direction of water. So one could conclude that trees are maybe very slow moving animals. 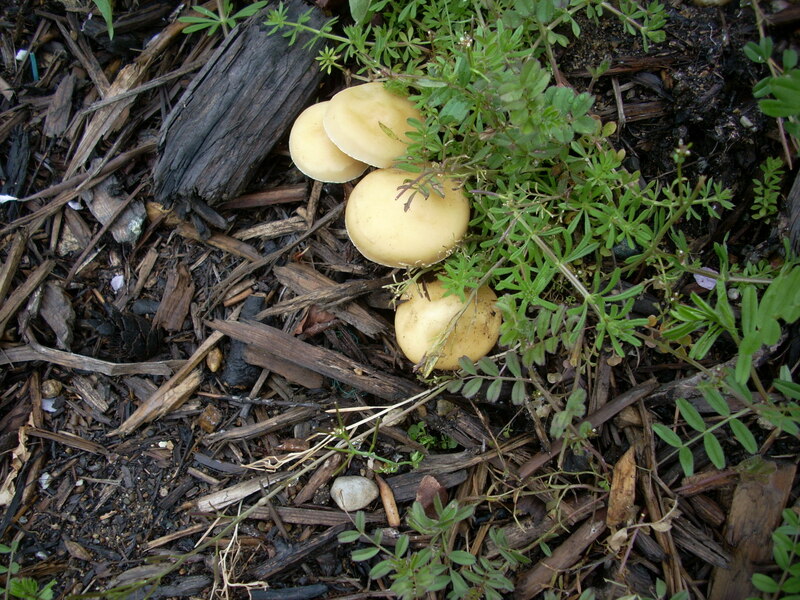 Fungi fall in to an order all of their own, having animal,plant and insect properties. 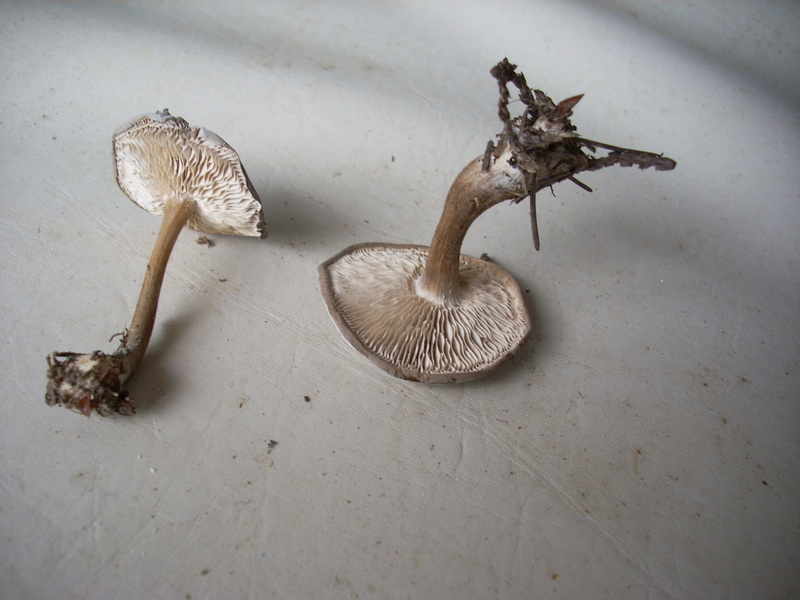 For example, some fungi have chitin in them, the stuff that is found in the exoskeletons of insects and crustacean. So where is all this rambling going you may ask? Well back to last Saturday.. I was on my quest for the elusive morel, so I wandered into a stand of Alder… I was all alone, there was no sound or traffic or human machinery… only the wind and the crunch of my feet on the dry duff on the forest floor… the clouds were moving very fast and the wind was picking up.. suddenly I felt this vibration in the ground and heard the trees clacking against each other… almost like they were talking to each other and the mycellium in the ground intertwined in their roots. 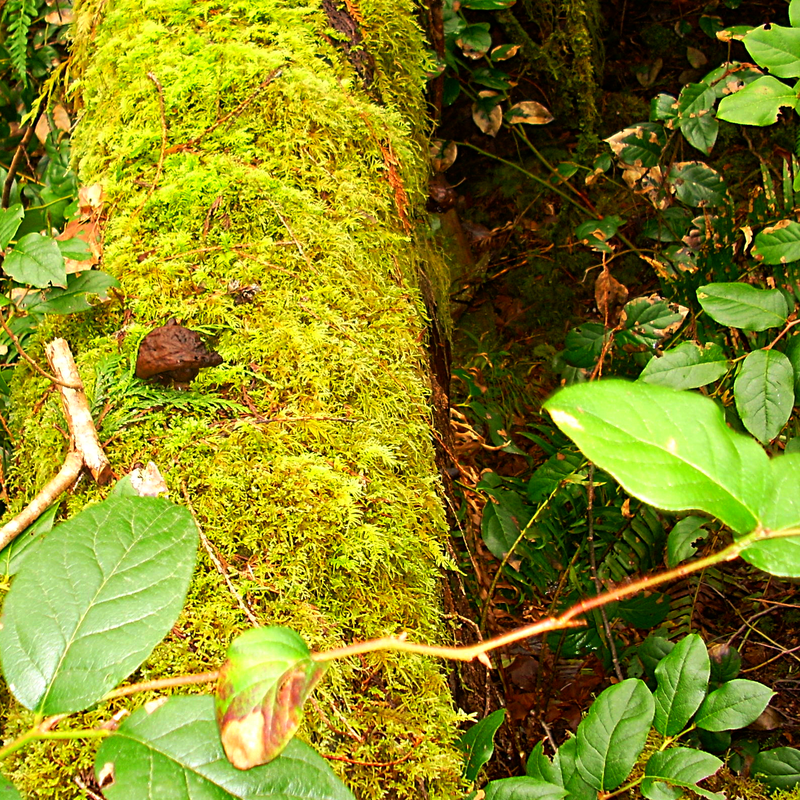 I have never really felt that vibration before, and I have spent a lot of time in woods as a kid and as an adult. If anyone has read the book ‘The day of the Triffids” by John Wyndhum or seen the movie, the clacking was eerily similar to the clacking that the Triffids used to communicate with each other. So I stopped and listened. But as soon as I stopped, the clacking slowed and stopped. Almost like the trees knew I was listening. The wind was still blowing, but the clacking quieted. Either the trees had said what they had to say and were waiting for a response or they didn’t want me to hear what they were saying. Now I am not a believer in the big guy in the sky, nor do I tend towards magical thinking, but this one experience makes me give more credence to the idea of the earth as being a living, breathing, feeling, thinking and even communicating, interconnected organism. Lets treat her with respect and love and nurture her and support her as she has us, our species, and other species for millions of years. Mother nature is more real for me than it ever has. I took a short video of that experience, but the quality is poor and it may not come across as intense as it was when I experienced it. However, go out there and try it yourself.. see if you can hear and feel Gaia’s voice. If not at first, don’t listen so hard.. relax, breathe deeply and slowly, walk carefully and maybe you will hear. 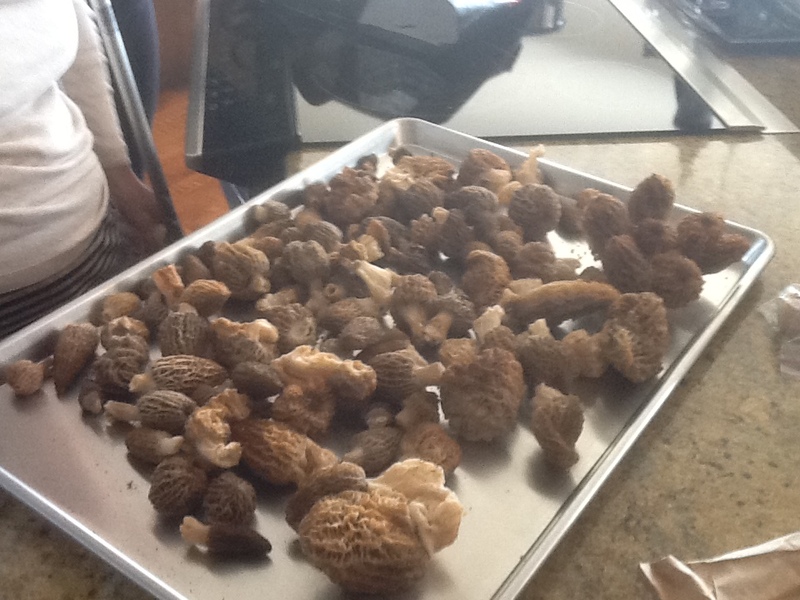 Yes… I finally found morels here on the coast!!! But I kind of cheated, in that I myself did not find them nor pick them. We were visiting a friend who had broken her ankle and while we were visiting, her daughter and son came in toting a shopping bag that seemed somewhat full, and heavy. Our friend asked her daughter, ” did you go to the place I told you, and did you fins anything?” Her daughter came over and said with a sheepish grin, “yes, you should see what we found”. She then proceeded to open the bag and show us her find. What a haul! 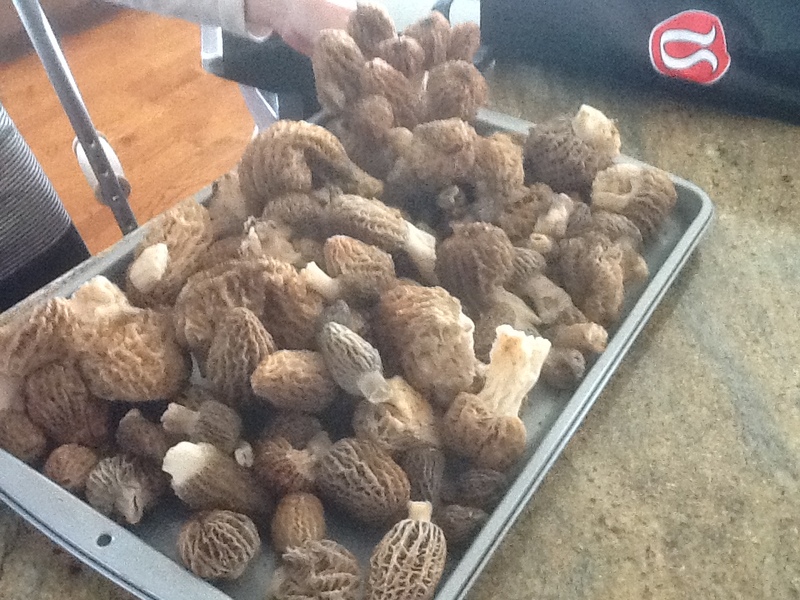 One was a cluster of 7 morels growing out of one stem. In addition to that find of morels, my friend’s son pulled out another bag which was full of stinging nettles. 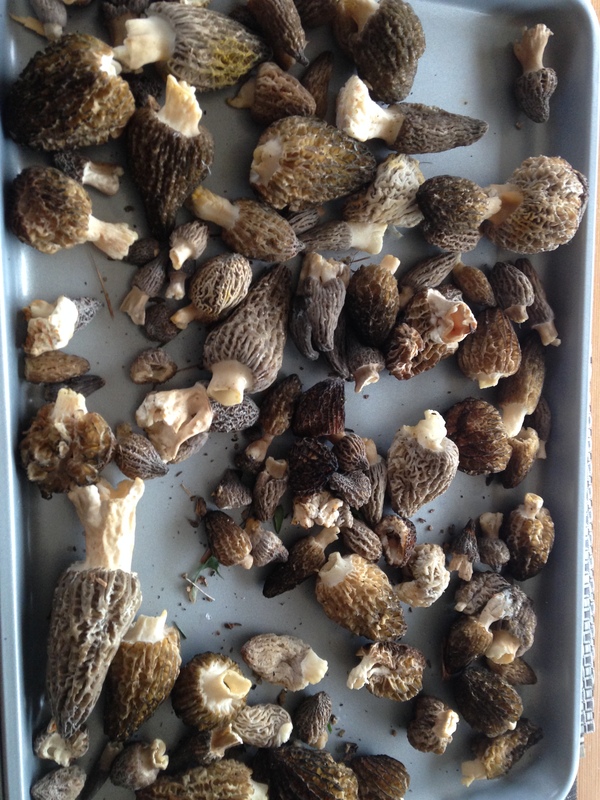 My friend is an avid wild forager, not only mushrooms but also edible and medicinal plants that grow here on the coast. Our friend generously offered us some of her bounty, which of course I accepted. Last night I made a dish that combined steamed fresh asparagus, placed raft style on a plate; then covered in morels that I had lightly floured and sauteed in chicken smaltz. removed them from the pan, de-glazed with white wine, added some chicken stock and 2 crushed cloves of garlic; added the mushrooms back to the pan and reduced the liquid by half; topped the layers of asparagus and morels with two poached eggs and a drizzle of black truffle oil. 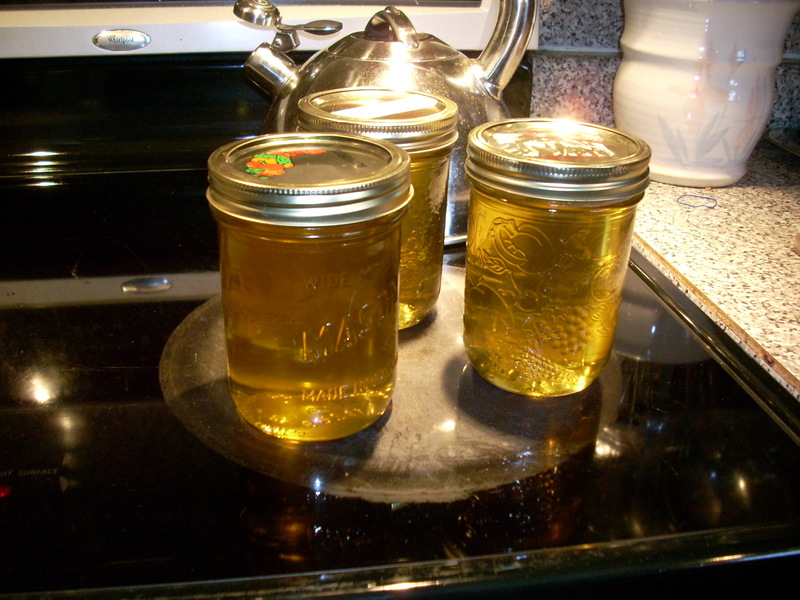 I also got a recipe for Dandelion Honey…. take a good couple of hand fulls of dandelion flowers, pluck out the yellow petals and put in a pot… add one L of water and bring to the boil… let steep over night and then strain out the petals and press the liquid from them. Add on kilo of sugar and put on the heat and cook until thick and syrupy… not too long as it will turn to candy. Put in jars and then use as sweetener for tea, on yogurt or on pancakes and waffles. I have never made this before, but it looks cool and I think that some of this in the middle of the long dark winter will be very welcome. Also, keeps your danelion’s from spreading too far. 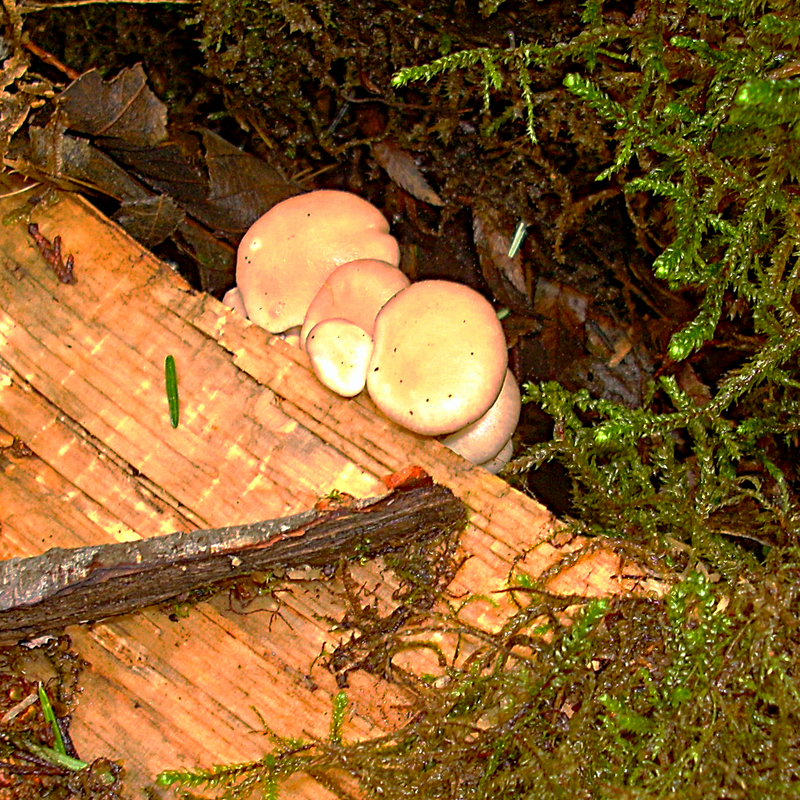 April Showers bring us Fungi? 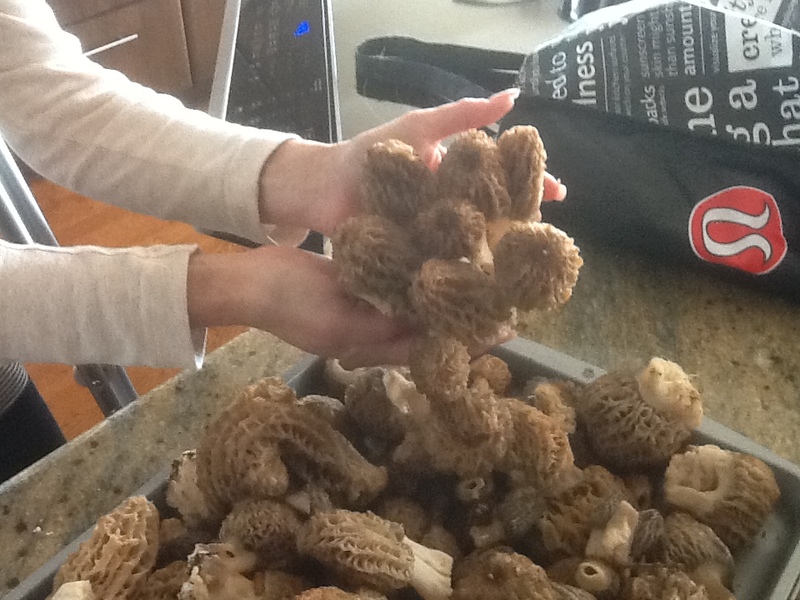 Easter weekend and nary a morel to be seen! I have been ooot and aboot almost every day this month and not one morel has poked it’s lovely wrinkled head in my direction. Why is it that the objects of our desire seem so elusive and ethereal? Others seem to enjoy their company so easily and frequently,while we pine away in our lonely quarters, reading field guides over and over, reviewing web-sites that delve into the secrets of finding these darlings of the fungi nation. Alas, so far it has been hit and miss. A friend of mine and another mycophile, stumbled upon a host of these beauties last week. With her permission, this is what she found while sourcing wild herbs and other medicinals. I have been out looking, but to date, not much is happening. 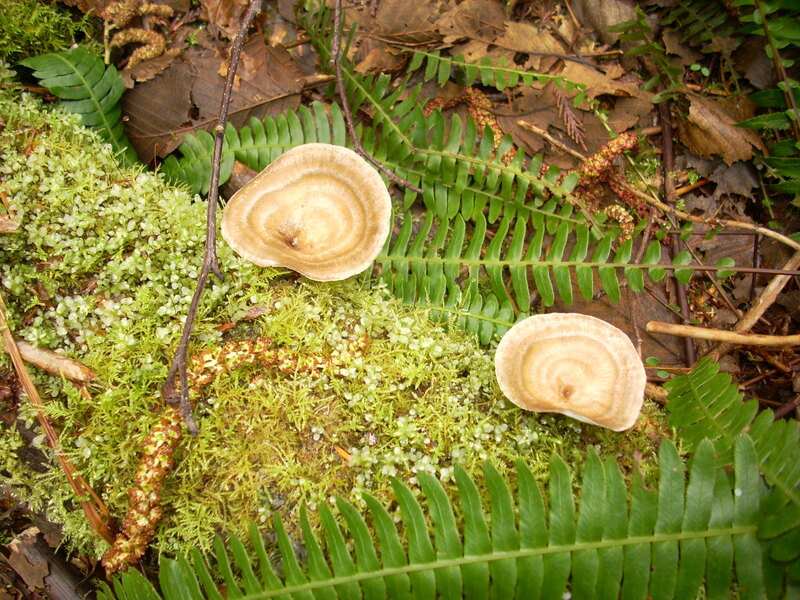 It has been cold and some what dry so mostly what I have been seeing are polypores, polypores and more polypores. 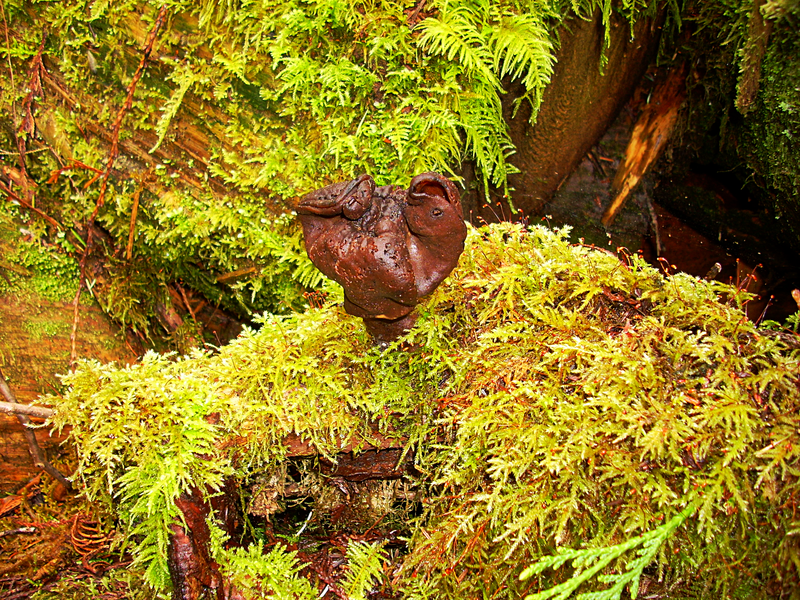 Last weekend I was out with Chris in Hidden Grove and saw a couple of false morels, Gyromitra (infula I believe) growing on an old log…one looked just like a black toad sticking his head up within the moss. 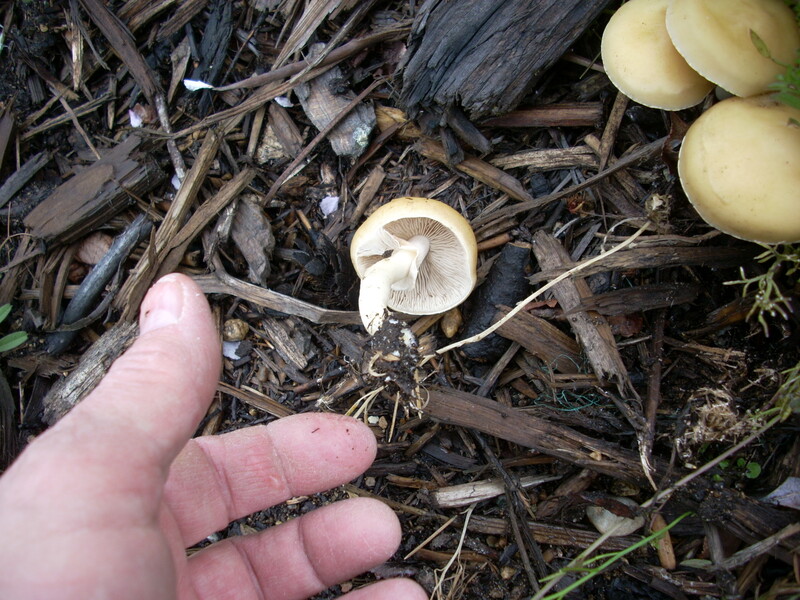 I also saw my first oyster mushrooms (Pleurotus ostreatus) They were very small and I decided to leave them to fill out a bit more and come back in a week and see if there were more. Still looking and hoping that I will find those morels, but I did find a beautiful patch of wild ginger that I had been seeking for the last two springs. It seems that what one seeks is always found when you are not looking and often closer to home than far. If anyone is interested in the ginger (Asarum caudatum), I will harvest and dry enough to give you a sample. 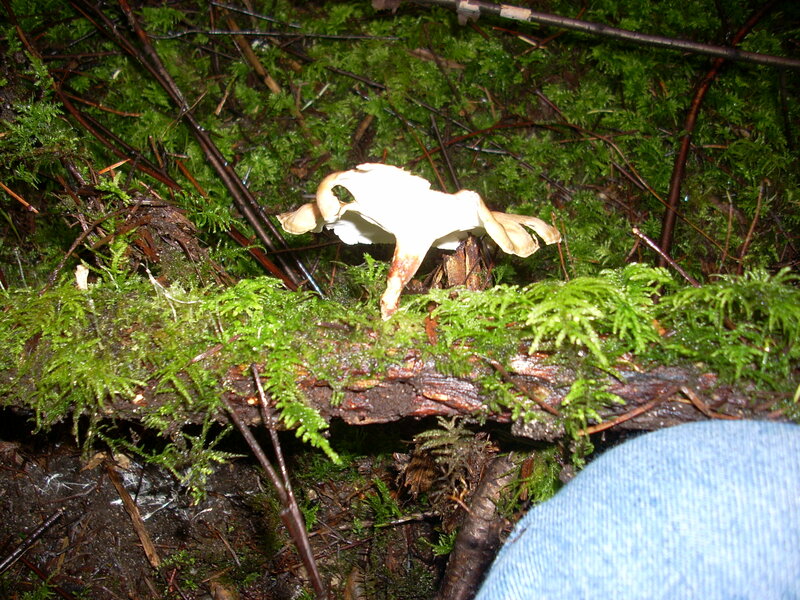 Maybe this spring we can do a combined mushroom foray and wild foraging for edible and medicinal plants and herbs. Keep looking and email me pictures of your finds.